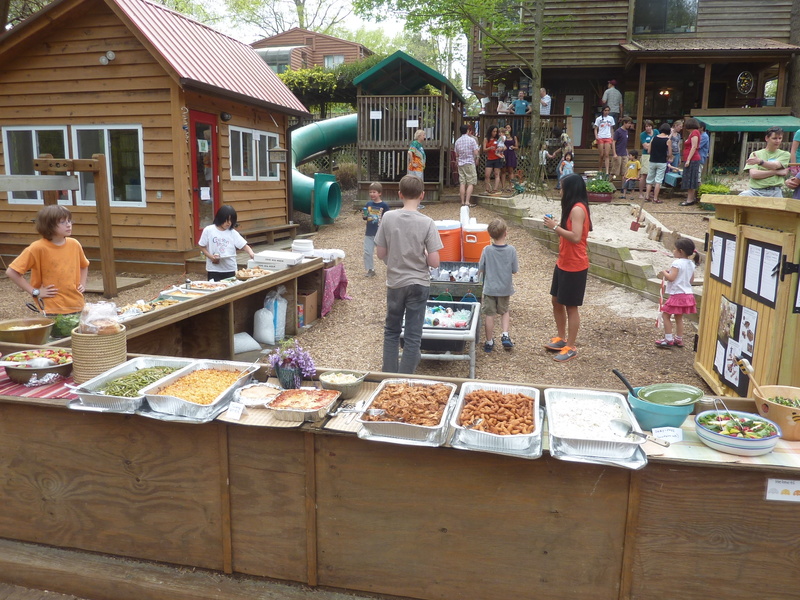 We see the “Block Party” we hosted in April 2013 –imagined initially as a simple fundraiser – as an example of a community process that highlighted the importance of the learning environment and the capabilities of children. 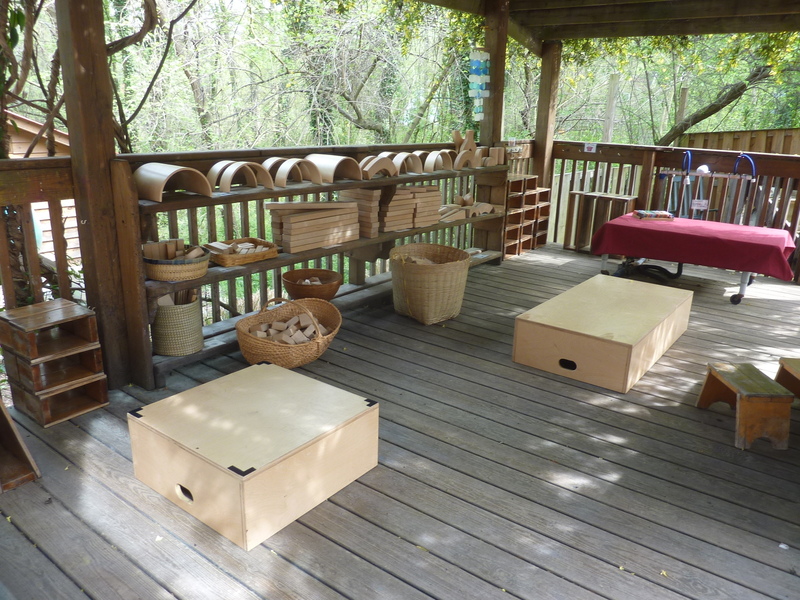 That winter, we saw the beautifully crafted and durable “Outlast” outdoor blocks from Community Playthings for the first time, and we were immediately filled with longing… knowing they would work wonderfully well in our outdoor learning environment – but they were SO expensive. Our board suggested that we throw a party as a special fundraiser… for one thing, it felt like “time” for another all-community party – the last one was in 2010 for our 20th birthday. Not to mention that Pierce Freelon (father of Justice and Stella Pierce) and his band The Beast had been looking for the right opportunity to play on our back deck for a community event. 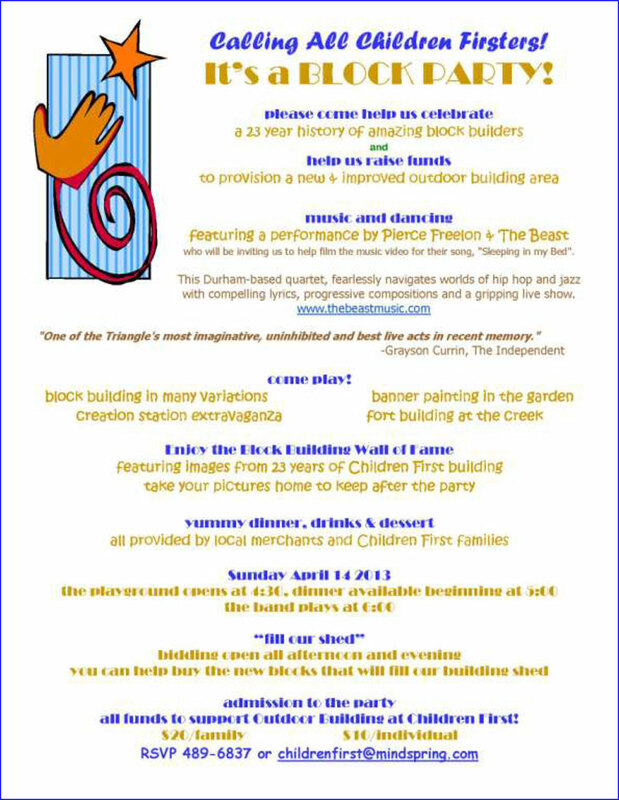 We decided to make the party ABOUT Blocks… and the importance of building… and the power of kids who build… so that we would have a collective sense of celebration and significance about raising the $5000 we needed for the new blocks and storage shed for outdoor pretending props. We set up a big magnetic wall that included a photo of every Children Firster building with some sort of builder (a mix of unit blocks, big blocks, Kaplas, brio mechs, foam blocks – all the different building materials we use here). The Children Firsters who were at the party found their photos on the wall, and took them when they left the party. We called it the Building Wall of Fame. This wall made a statement about the way we value building and the way we value each child as a builder. And it’s a non-negotiable Children First tradition that at any gathering every Children Firster will be “named” or “seen” in some way. 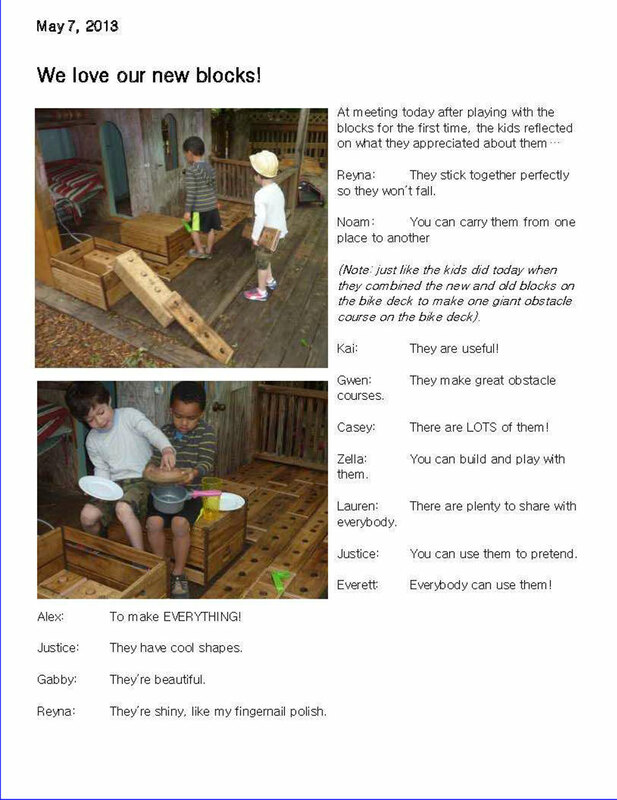 We set up building opportunities all over the playground… including big loose parts at the creek, where there was a LOT of action. 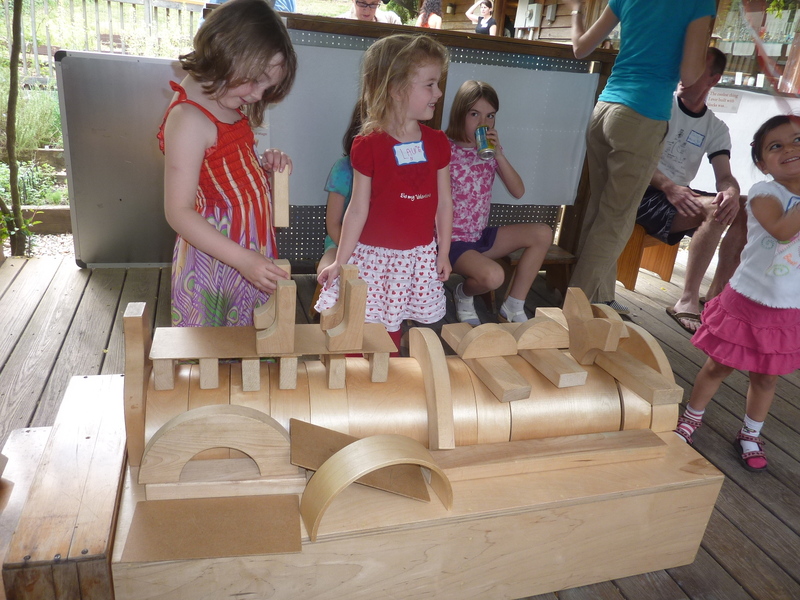 We converted the water deck into a big building deck and brought all our indoor unit blocks outside… during the party, there were some especially great moments of collaboration between college kids and preschoolers – high towers, interesting ramps, complicated representations of real buildings. 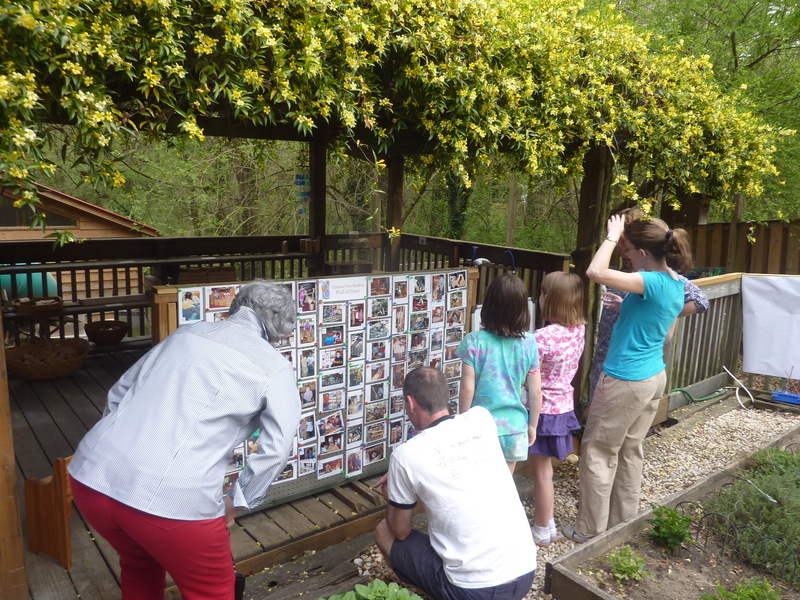 For fundraising, we posted silent-auction style bid sheets on a little shed of loose parts that we’d just added to the middle of the playground… each with the image and dimensions and cost of each of the particular blocks… so that bidders were “buying blocks”… to help us create a set. 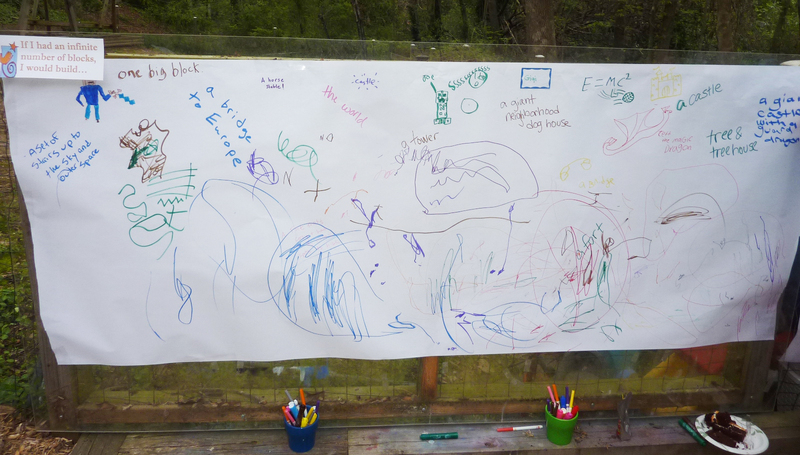 And, we set up “graffiti walls” all around with questions about building… along with poster-sized quotes that we pulled from answers to the surveys about blocks and building parents and kids had been doing at school. a bike with no wheels. a handyman without a hammer. a bed without a pillow. they remind me of Children First. they can be used over and over a million different ways. they encourage you to use your imagination. they make awesome obstacle courses. I love climbing and I have memories of climbing on big blocks with Jake, Ayo and Maya. you can spend an entire day playing with them. they make a beautiful noise when you stack them (and when they fall). there are a million different ways to combine them – never ending creativity. they keep me from being block-headed. the second world trade center. a fort that’s cozy and lots of nooks and spots to hide. a big obstacle course with gymnastics equipment. a set of stairs up to the sky and outer space. 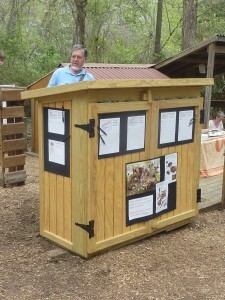 a giant neighborhood dog house. a giant castle with a guard dragon. a tree and tree house. a yellow brick road where everyone is invited to walk and play together. 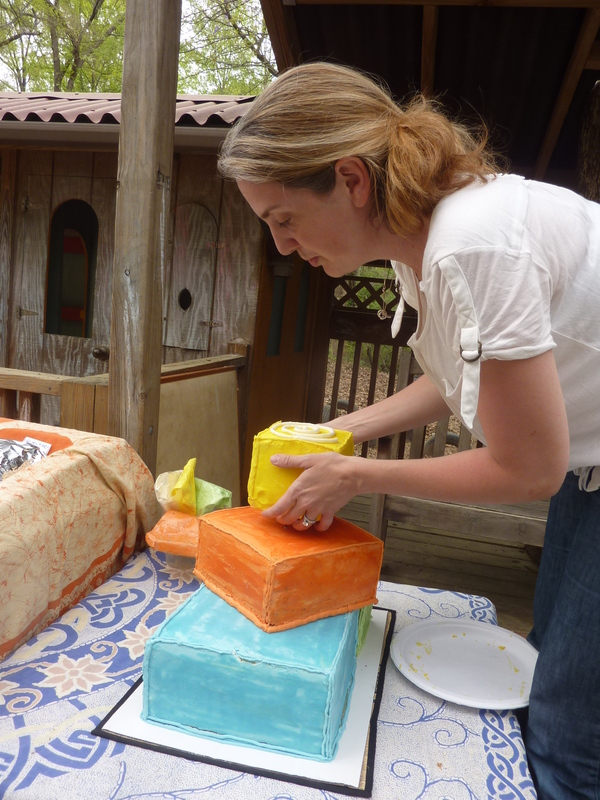 Jessica, a Children First Mom, offered to make a cake for the party – and she made it look like building blocks!